Well, tomorrow is almost certainly a washout, but I will plan the rides anyway. I will send out a GO or a STOP notice before 8:00 tomorrow morning. Tomorrow, we will try a new starting point in Harvard. We will be meeting at the Harvard Track behind the Harvard Post Office on Route 110. Here is a map. Janet told me about a new path that connects Depot Road to the area on the other side of Route 2. Thanks Janet! The path is loose gravel and not very suitable for road bikes, so I will be bringing my born again - again Bianchi Hybrid Bike. On Friday October 1st, we will meet at the Harvard Track. Here is a map. * At 11:30 AM - We will have a picnic lunch from Sorrento's or Pizza Bella. GO - Nice Fall Colors Too. Well, it looks like another warm, muggy day is on the way for tomorrow, so I scheduled a shorter, easier, ride with a optional swim along the way. Tomorrow, we will meet at the Rail Trail parking in Groton Center at 9:30 AM. Here is a map. Only parallel park between the signs and make sure you are facing the correct direction (facing away from Buckingham Bus). After I do a final precision parking check, we will head for West Groton for a ride along the Squannacook River. Then we will head UP Wallace Hill Road in Townsend, DOWN to the Nissitissit River and back on the Rail Trail. The route is about 24 miles and 600 feet vertical, mostly on Wallace Hill Road. There may be some off road if we decide to go to Bertozzi, but I'm bringing my road bike anyway. Here is a map. On Wednesday, September 29th - We will meet in Groton Center at the Rail Trail parking. Here is a map. * At 9:30 AM - We will leave for West Groton. Here is a map. * At 12:30 PM - We should be back. * At Noonish - We will have lunch (Filho's?). On Friday October 1st, we will meet at Harvard. * At 11:30 AM - We will have a picnic lunch. STOP - All Monday Rides Are Postponed. First of all, CONGRATULATIONS to Joe, Jane, and Donna for completing 100 miles in NH and ME this weekend. 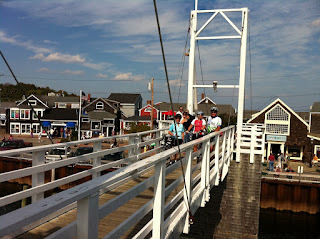 Check out the picture from the Perkins Cove drawbridge. Also, thanks to Bobbie and Carole for joining us today for our 50 mile ride around "The Great Bay". Here is a map of Saturday's ride to Ogunquit, ME. Here is a map of Sunday's ride Dover, NH. So, the weather tomorrow isn't looking so good :-( The forecast for tomorrow is near 60 degrees with a 40% chance of rain. I'll let you know before 8:00 tomorrow morning. The morning Fitness Ride will explore some pretty backroads of Westford on our way to Heart Pond in South Chelmsford. After a snack / swing (and new PortaPotty) we will ride a bit of the Bruce Freeman Rail Trail on the way back to Forge Pond. The route is a little over 17 miles and 350 feet vertical. Here is a map. There is a bit of gravel, but I plan to bring my road bike anyway. The afternoon Recreation Ride will feature the old East Boston Camps in Westford and we will visit the beach at unspoiled Burgess Pond. From there we will go to Nabnassett Pond (with new PortaPotty) for a snack / swing. The route is about 13 1/2 miles with a little less than 200 feet vertical. Here is a map. There will be some civilized off road around Burgess Pond. I plan to bring my road bike anyway. On Monday, September 27th, we will meet at Forge Pond Beach in Westford. Here is a map. Next Week - Westford - ? - ? At 9:30 AM - The Fitness Ride will leave. At 12:15 PM - The Recreation Ride will leave. GO - It's a warm Fall day. Come one, come all, to the Human Powered Vehicle Festival in Groton Center on October 16th (rain date on the 17th). AdventuRides will be there with a table, and I will be bringing a few of my stranger bicycles. The weather roller coaster continues. Tomorrow is going to be a warm day with Mostly Cloudy skies and upper 60s in the morning, upper 70s in the afternoon. It will be a bit breezy and humid, but not a bad day for riding! The Recreational Ride will go to beautiful Downtown Boxborough (don't blink) and on to Flagg Hill before returning past the restored Victorian houses in West Acton. The route is 12 miles long with rolling hills. It is all on road. Here is a map. The Fitness Ride will travel to the Acton Arboretum. Then its on to Maynard before returning after a brief ride along the future Assabet River Rail Trail. The route is 15 1/2 miles long with rolling hills. There is some civilized off road in the Arboretum and also on the Rail Trail. Here is a map. BTW, my hybrid bike is in pieces during its overhaul, so I will be bringing my road bike. On Friday, September 24th, we will meet at the Elm Street Playground near Idylewilde Farm in Acton. The nearest intersection is Central Street and Elm Street. Here is a map. * At 9:30 AM - The Recreational ride will leave. Here is a map. * At 11:30 AM - We will have a picnic lunch from Idylwilde Farm. * At 12:15 PM - The Fitness ride will leave. Here is a map. GO - It's the last day of Summer! Well, tomorrow is the last day of astronomical summer and the weather is going to cooperate. It should be upper 60s when we start, upper 70s for our brewpub lunch outside on Main Street, and low 80s by the time we get back. The route is a little over 25 miles, with 15 miles downhill to lunch and 10 miles uphill on the way back. Along the way we will visit the Merrimack River and see the historic houses on the way into downtown Nashua. After lunch we will ride the extension of the Nashua River Rail Trail in downtown Nashua and explore Mine Falls Park along the old canals. There is some dirt / gravel along the way, but as usual I am bringing my road bike. On Wednesday, September 22nd, we will meet at the Lawrence Barn in Hollis, NH. Here is a map. * At 9:30 AM - We will leave for Nashua and the Merrimack River. Here is a map. * At 2:15 PM - We should be back. You might want to bring fleece and/or windbreaker. Last week, we had an amazingly good time on the Paddle, Pedal & Picnic and we had a nice, slightly wet, ride Friday afternoon. This week, the weather for Monday is looking like a top 10 day. The forecast is for sunny and 60 in the morning and near 70 in the afternoon. The morning Fitness Ride will go to quaint Hollis Center by way of the Beaver Brook Association after visiting the new covered bridge and the Nissitissit River. We will also stop at the Nashua River Rapids on the way back. The route is about 16 miles with 500 feet total ascent. There are a few miles of dirt / gravel road, but other than that it is all paved. As usual, I plan to ride my road bike. Lunch will be at the Pepperell Spa. The afternoon Recreation Ride will feature the Nashua River Rapids in Hollis, NH. The route is all on road and between 10 and 13 miles long depending on how we are doing. Its mostly flat with just 360 feet total ascent. On Monday, September 20th, we will meet in East Pepperell Center. Here is a map. * At 9:30 AM, the Fitness Ride will leave for quaint Hollis Center, NH. Here is a map. * At 11:30 AM, we will have lunch at the good ole Pepperell Spa. * At 12:15 PM, the Recreation Ride will leave for the Nashua River Rapids. Here is a map. * At 9:30 AM - We will leave for Nashua and the Merrimac River. Here is a map. On Friday, September 24th, we will meet at the Elm Street Playground near Idylewilde Farm in Acton. The nearest intersection is Central Street and Elm Street. The morning ride is cancelled. Everyone is welcome to join us for the afternoon ride. Hope to see you at 12:15! Well, the weather forecast isn't looking so good for tomorrow morning, but by afternoon it could be dried out enough. Remember - I will send out email tomorrow morning before 8:00 AM with either a GO or a STOP status. If you don't get an email, check your SPAM folder, or go to AdventuRides.com for the latest status. The morning Recreation Ride will travel to Chelmsford Center on the new Bruce Freeman Rail Trail then explore the Cranberry Bogs and finally ride through a bit of Carlisle before returning on the BFRT. The route is about 12 miles and 360 feet elevation gain. It will be all on road. The afternoon Fitness Ride will also start on the Bruce Freeman and travel south to explore Carlisle and Great Brook Farm State Park. The route is about 16 1/2 miles with 700 feet elevation gain. It will be almost all on road. There is a short stretch of dirt / gravel road in GBFSP. On Friday September 17th, we will meet at Heart Pond in South Chelmsford. Here is a map. * At 9:30 AM - The Recreation Ride will leave for Chelmsford Center. Here is a map. * At 11:30 AM - We will have a picnic lunch at Heart Pond with subs from Kate's Corner. * At 12:15 PM - The Fitness Ride will leave for Carlisle. Here is a map. You might want to bring your fleece. 1. Change of plans for Paddle, Pedal & Picnic. It may be raining now, but the Nashua River is still very low. We are now planning to paddle the river from West Groton to Pepperell Ponds. There is a bunch of history along this stretch of river and Pepperell Ponds has an enormous variety of wildlife. The best part is that we will not be dragging bottom since there is the dam at Pepperell. The weather forecast looks like perfect Fall weather with sunshine and upper 60s. We still have a few spots left for you procrastinators. You can sign up at Acton Recreation. Click on Adult Programs, and select #134 Paddle, Pedal & Picnic. All expenses, including lunch, are part of the deal. You will need to bring your bike and a helmet. * At 9:30 AM - We will meet at the Nashua River Watershed Association parking lot. Please park at the back of the lot. Here is a map. The address is 592 Main Street, Groton, MA. From there we will provide shuttle service to Nashoba Paddler in West Groton. * At 10:00 AM - We should be on the river and enjoying the sunshine, tranquility, and history. * At somewhat past noonish - We will climb out of the canoes, climb on our bikes and head for Filho's Cucina (about 2 miles away) for a truly outstanding lunch (included in the price). * After Lunch - We will climb back on our bikes and head for the scenic backroads of Groton and Pepperell. This will be a recreational sort of ride that will be customized for the group. * Before 4:00 PM - We will be back. Since I screwed up this morning, Lets do the Hollis ride tomorrow morning. On Tuesday, September 14th, we will meet in East Pepperell Center. Here is a map. * At 9:30 AM, the "I Just Gotta Ride" Ride will leave for quaint Hollis Center, NH. Here is a map. We might extend this if people want to. * At Noonish, we will have lunch at the good ole Pepperell Spa. The weather for Monday isn't looking as good as it was :-( The forecast is for 40% chance of rain. I will send out email and change the website before 8:00 tomorrow morning with the latest ride status. On Monday, September 13th, we will meet in East Pepperell Center. Here is a map. Welcome to AdventuRides Fall 2010 Season. Can you believe this is our 14th season? Last time I checked, there were still a few spots left on our NEW Paddle, Pedal & Picnic adventure on Wednesday. To register, go to Acton Recreation. Its activity #134. This week is Rail Trail Week here at AdventuRides. We find that this is a good way to build up our mileage and stretch our legs without having to deal with too many cars. On Monday, September 13th, we will explore the northern half of the Nashua River Rail Trail and surrounding areas. 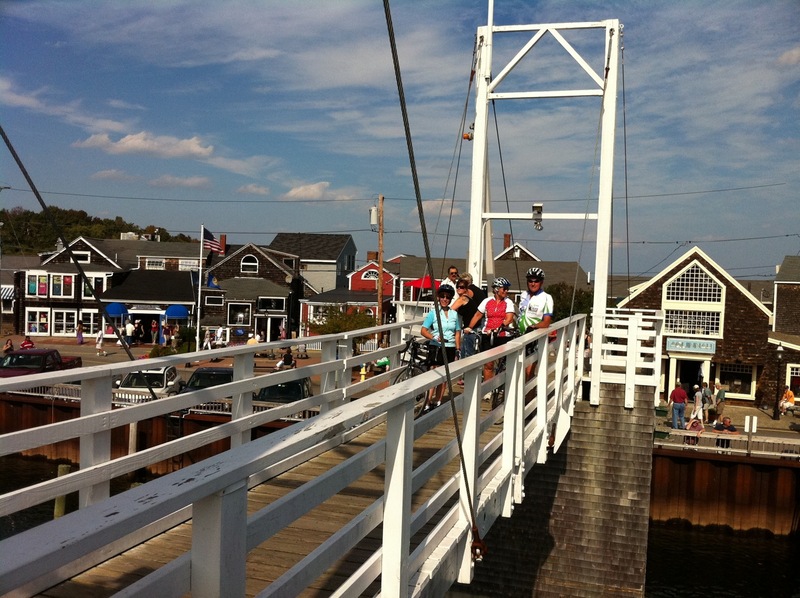 On Friday, September 17th, we will cruise the new Bruce Freeman Rail Trail in Chelmsford. The weather for Monday is looking better all the time! The forecast is for low 60s and partly cloudy in the morning, low 70s in the afternoon. On Wednesday, September 15th, we are excited to offer the first ever Paddle, Pedal & Picnic on Wednesday, September 15th. Space is very limited, so signup today at Acton Recreation. Its program #134. There's nothing better than a fall day in New England. Join us for a relaxing day of canoeing and bicycling in beautiful Nashoba Valley. After quick instruction on canoe safety and technique, Diane Carson, owner of Nashoba Paddler of West Groton, will be our guide, highlighting historical and natural points of interest along 5 miles of the Nashua River. Wildlife sightings this year have included great blue herons, bald eagles, beavers, owls, snapping turtles and muskrats. We will then ride our bikes to a delicious lunch at Filhos Cucina in Groton Center. We will complete the afternoon with a moderate bike ride through rolling country roads. Canoeing equipment, transportation to the put in point, and lunch at Filho's are included in the price. You will need to provide your own bicycle, helmet, etc. If you believe the long range weather forecast, it looks like an outstanding Fall day! * At 9:30 AM - We meet at Nashoba Paddler in West Groton. * At 10:00 AM ish - We will put in at the Ice House Dam in Ayer. * At 12:30 PM ish - We should be back to Nashoba Paddler. Then its on to a delicious lunch at Filho's Cucina. * At 2:00 PM ish - We will take off on the bikes for a lovely Fall exploration around the Nashoba Valley. * At 4:00 PM - We will be back. On Friday, September 17th, we will meet at Heart Pond in South Chelmsford. Here is a map. * At 9:30 AM, the Recreation Ride will leave. * At 11:30 AM, we will have a picnic lunch from Kate's Corner. You may want to bring your fleece. We got a note from Action Recreation this morning, and the trip is beginning to fill up. If you are interested, you should sign up real soon! We are excited to offer the first ever Paddle, Pedal & Picnic on Wednesday, September 15th. Space is very limited, so signup today at Acton Recreation. Its program #134. What the heck happened to Summer? Tomorrow's ride will feature lovely Fall-like weather. It should be partly cloudy and low 60s in the morning and upper 60s in the afternoon. Note the 9:45 AM Start time at Fawn Lake and 10:00 AM at Bedford Depot to allow extra drive time to the start. On Friday, September 10th, we will meet in Bedford for a ride on the Minuteman Bike Trail to Somerville. Here is a map. There will be two starting points. From Fawn Lake, we will ride the unpaved narrow gauge rail trail to the start of the Minuteman at Bedford Depot. Its about 27 miles round trip. For a shorter, paved, and very flat ride, you can meet us at Bedford Depot for a 22 mile round trip. Everyone is welcome. * At 9:45 AM - We will leave from Fawn Lake. * At 10:00 AM - We will pick up riders from Bedford Depot. * At 11:30 ish - We will have lunch at Dave's Fresh Pasta in Somerville. * At 2:15 PM - We should be back to Bedford Depot. * At 2:30 PM - We should be back to Fawn Pond. * We can continue on to Billerica and back to get our 30 miles in if desired. Well, I'm back from Bar Harbor, I survived last week's heat wave, and we are looking forward to our 14th season of AdventuRides! So, I have a few items to bring to your attention. 1. The official starting date of AdventuRides Fall 2010 is Monday, September 13th and you can register at either Acton Recreation or Littleton Recreation. Since I proved my incompetence last season, I will no longer be accepting registrations in person. However, both Acton and Littleton now accept credit cards and you can do everything online. BTW, your first ride is free. Give us a try and then register for the most fun you can have on a bike! 2. We are excited to offer the first ever Paddle, Pedal & Picnic on Wednesday, September 15th. Space is very limited, so signup today at Acton Recreation. Its program #134. 3. To kickoff the Fall season, we are planning a Pre-Season Ride on Friday, September 10th. The current plan is to ride the Minuteman Rail Trail from Bedford to Somerville and back with our usual amazing lunch at Dave's Fresh Pasta in Davis Square. Stay tuned for more details. 4. Yes, I know its a little early, but Wachusett Mountain sent me a whole bunch of Greatest Possible Savings club applications. The best deal in skiing costs $10 more this year, but $229 for a weekday season pass is still an unbeatable deal. Stay tuned for more information.